We can’t touch time, or smell it. Yet it is utterly inescapable. But, research shows, time is – at least partly – something we control in our heads. Although we rely on other ques when they are available, have you ever woken from a good sleep because you have told yourself you must get up at a certain time? I know many times when I set an alarm for getting up for a specific event, my body wakes me about 2-10 minutes early. The body clock determines our most fundamental behaviours: when we wake up, go to sleep, and eat. But it also determines our physical strength and performance over a day. However basic the clock’s functions seem to us today, its existence was only proved in 1962, by a French caver. 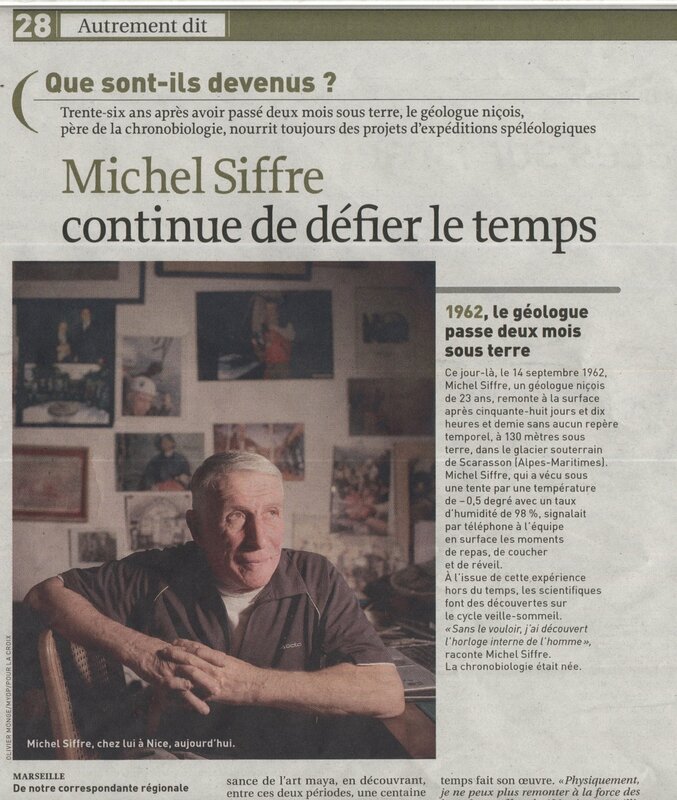 Michel Siffre had been planning to study the movement of a glacier through an underground cave, when he realised the enormous potential of his experiment for the field of biology. 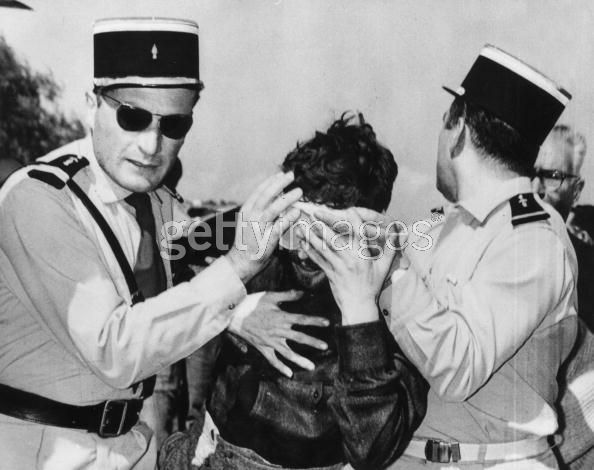 “I had the idea of my life: I decided not to take a watch in the cave. I decided to live without time cues,” he said. By isolating himself underground, away from daylight, clocks or routines, he hoped to discover whether the body had its own rhythm. And if so, what it was. 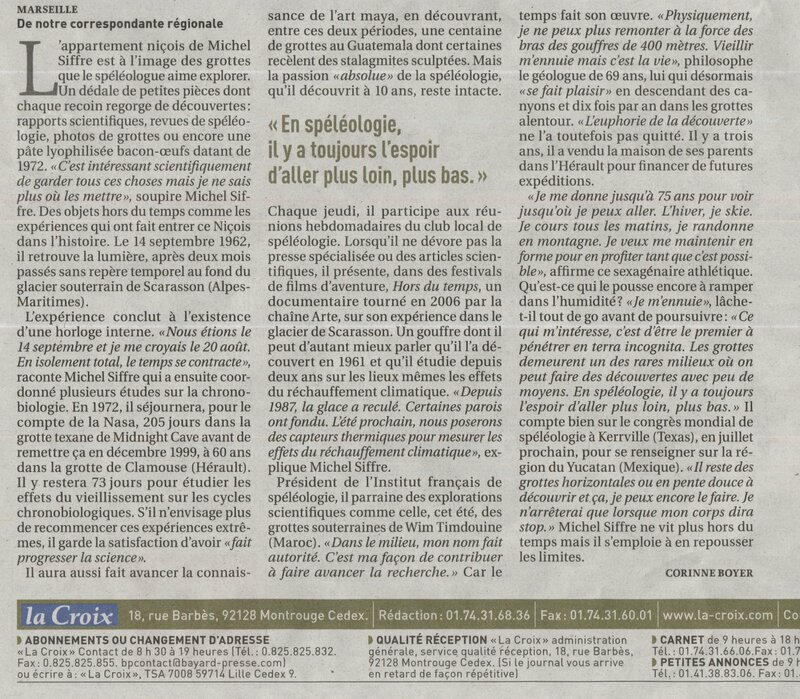 The continuation of the newspaper article is in French also. “I decided to live following my feelings of hunger, my feelings of going to sleep. In the cave it’s always dark, then your body follows its own sense,” said Mr Siffre. His plan was to call a surface-team of assistants every time he woke, ate, exercised or urinated so every one of his biological functions could be monitored. Each time, he would give an estimate of the date and time, and the surface-team would compare this with the real time. This he did for two months, before emerging into the real world. Mentally, he had completely lost track of time, but the results showed his body had kept up a rhythm. While the length of Siffre’s waking days varied widely, from 40 hours to just six, a clear pattern emerged. The average length of his days was just over 24 hours. Evolution, it seems, had tailored his body’s clock to run closely to the Earth’s day length. It’s now known that the body clock is controlled by a tiny pea-sized organ in the brain called the suprachiasmatic nucleus, or SCN. This tiny region commands a chain of chemical and nervous instructions that ripple through the body, controlling how each organ and tissue functions over the 24-hour day. The suprachiasmatic nucleus or nuclei, abbreviated SCN, is a tiny region on the brain’s midline, situated directly above the optic chiasm. It is responsible for controlling circadian rhythms. The neuronal and hormonal activities it generates regulate many different body functions in a 24-hour cycle, using around 20,000 neurons.